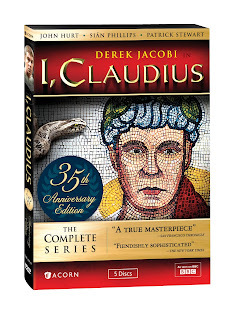 Just recieved this image of the I, Claudius 35th Anniversary edition DVD. Very excited about it hitting shelves this month and can't wait for my copy to arrive. Started re-reading the books this week to make the most out of the experience. The great thing about both the books and the miniseries is they stand up to repeated readings and viewings. Each time I go back to them I notice things I missed before. Apparently this DVD will use the 2008 remastered version of the miniseries (which is a good thing). My current copy is a bit ancient on its owns and the transition from film to DVD was less than stellar, so I am eager to see it polished up.